The overall appearance, functionality and sustainability of a landscape, depend on the quality of products, materials and workmanship used in the installation. While excellent landscape design is the foundation of a stable and functional landscape, it’s also very important to make sure that all the features and elements are installed with attention to detail. Even the best quality materials, if installed shoddily can result in early deterioration or damage to the features. One of the best ways to ensure this doesn’t happen is to hire the services of proven landscape installation contractors like the ones at Piracci's Landscaping, Inc. We are a premier company in the landscaping space and have over 25 years of experience behind us; and cater to companies in and around Abington, Bedminster, and Buckingham. 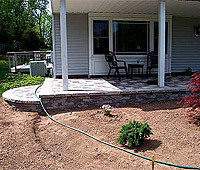 Landscape installation is a job that you can’t entrust to professionals with very little experience. They are a number of different factors that come into play and only an experienced local landscaper would be able to provide the best solutions. Our team has custom designed and installed landscapes throughout Center Valley, Chalfont, and Coopersburg. Our creations have helped enhance the appeal and value of properties in and around Doylestown Dublin as well as Hatboro. Many clients in Huntingdon Valley, Lederach and the surrounding areas trust only us for all their landscaping needs. We understand that using the right installation techniques is crucial in creating resilient and long lasting landscapes that would add to the beauty and functionality of the available space. Since landscape projects involve installation of both hardscapes and softscapes, it’s important to complete the work in a coordinated manner. On our team are certified, well-trained and seasoned masons, horticulturists, paver installers, retaining wall and custom stonework specialists, carpenters, gardeners etc. All of these professionals work in a seamless manner to ensure that your landscape installation project progresses without any glitches. Our experienced on-site supervisors make sure that every stage of the project is completed methodically, in a timely manner. They will maintain constant communication with you over the course of the project so you are aware of the progress. Only the best materials would be used in the work, and the latest techniques and tools will be employed in all the installations. This approach goes a long way to ensure you get outdoor spaces that are appealing, practical, stable and sustainable. If you are looking for a company that provides start to end landscape design and installation services, Piracci's Landscaping, Inc. is the company to call. Feel free to call us at and discuss your project details with your clients. You also have the option to send us queries about our services and landscape installation cost via this Contact Us form and we will respond quickly.